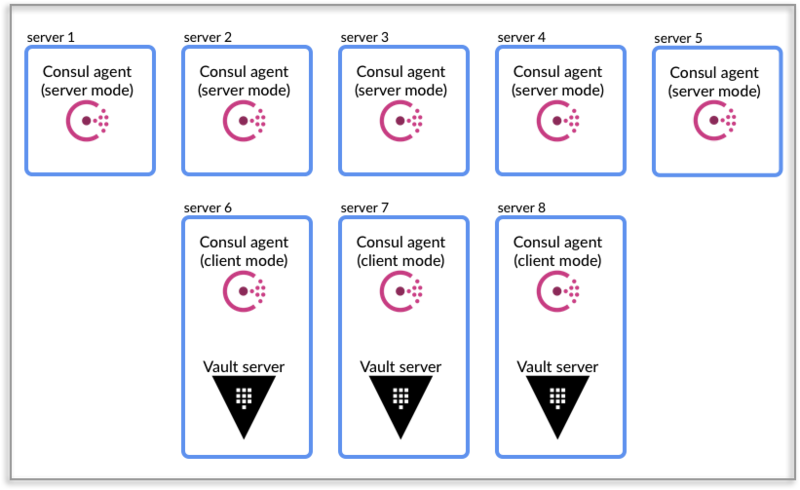 2 minThis learning path is designed to help you deploy your first Vault cluster. This document assumes Vault uses Consul as the storage backend since that is the recommended storage backend for production deployments. This section explains how to deploy a Vault open source cluster in one datacenter. Support for multiple datacenters is included in Vault Enterprise through cluster replication. This design is the recommended architecture for production environments, as it provides flexibility and resilience. Consul servers are separate from the Vault servers so that software upgrades are easier to perform. Additionally, separate Consul and Vault servers allows for separate sizing for each. Vault to Consul backend connectivity is over HTTP and should be secured with TLS as well as a Consul token to provide encryption of all traffic. NOTE: Refer to the online documentation to learn more about running Consul in encrypted mode. Typical distribution in a cloud environment is to spread Consul/Vault nodes into separate Availability Zones (AZs) within a high bandwidth, low latency network, such as an AWS Region. The diagram below shows Vault and Consul spread between AZs, with Consul servers in Redundancy Zone configurations, promoting a single voting member per AZ, providing both Zone and Node level failure protection. NOTE: Refer to the online documentation to learn more about the Consul leader election process. The following table provides guidelines for server sizing. Of particular note is the strong recommendation to avoid non-fixed performance CPUs, or "Burstable CPU" in AWS terms, such as T-series instances. The small size category would be appropriate for most initial production deployments, or for development/testing environments. The large size is for production environments where there is a consistent high workload. That might be a large number of transactions, a large number of secrets, or a combination of the two. In general, processing requirements will be dependent on encryption workload and messaging workload (operations per second, and types of operations). Memory requirements will be dependent on the total size of secrets/keys stored in memory and should be sized according to that data (as should the hard drive storage). Vault itself has minimal storage requirements, but the underlying storage backend should have a relatively high-performance hard disk subsystem. If many secrets are being generated/rotated frequently, this information will need to flush to disk often and can impact performance if slower hard drives are used. Consul servers function in this deployment is to serve as the storage backend for Vault. This means that all content stored for persistence in Vault is encrypted by Vault, and written to the storage backend at rest. This data is written to the key-value store section of Consul's Service Catalog, which is required to be stored in its entirety in-memory on each Consul server. This means that memory can be a constraint in scaling as more clients authenticate to Vault, more secrets are persistently stored in Vault, and more temporary secrets are leased from Vault. This also has the effect of requiring vertical scaling on Consul server's memory if additional space is required, as the entire Service Catalog is stored in memory on each Consul server. Furthermore, network throughput is a common consideration for Vault and Consul servers. 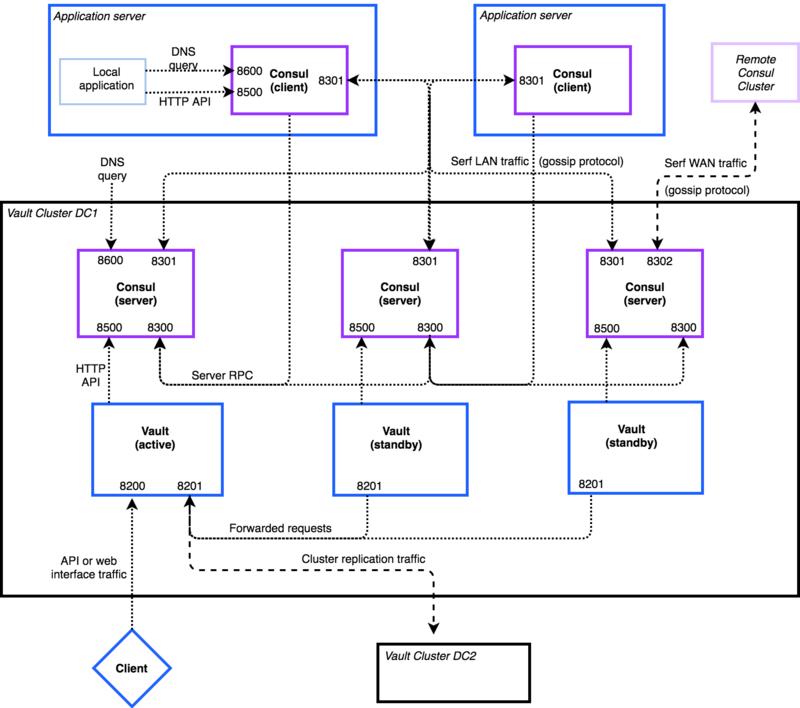 As both systems are HTTPS API driven, all incoming requests, communications between Vault and Consul, underlying gossip communication between Consul cluster members, communications with external systems (per auth or secret engine configuration, and some audit logging configurations) and responses consume network bandwidth. 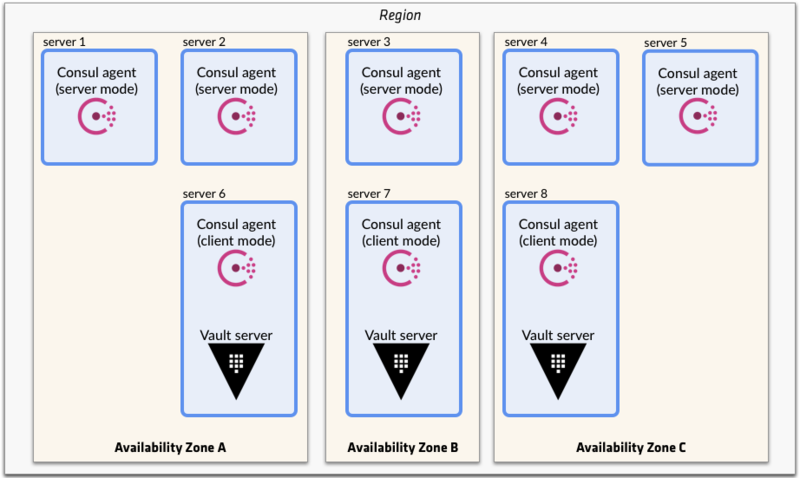 Due to network performance considerations in Consul cluster operations, replication of Vault datasets across network boundaries should be achieved through Performance or DR Replication, rather than spreading the Consul cluster across network and physical boundaries. If a single consul cluster is spread across network segments that are distant or inter-regional, this can cause synchronization issues within the cluster or additional data transfer charges in some cloud providers. Vault Production Hardening Recommendations provides guidance on best practices for a production hardened deployment of Vault. This relies upon the operating system DNS resolution system, and the request could be forwarded to Consul for the actual IP address response. The operation can be completely transparent to legacy applications and would operate just as a typical DNS resolution operation. Note that the above block could be generated by Consul (with consul-template) when a software load balancer is used. This could be the case when the load balancer is software like Nginx, HAProxy, or Apache. There are two supported methods for handling client IP addressing behind a proxy or load balancer; X-Forwarded-For Headers and PROXY v1. Both require a trusted load balancer and require IP address whitelisting to adhere to security best practices. A Vault cluster is the highly-available unit of deployment within one datacenter. A recommended approach is three Vault servers with a Consul storage backend. With this configuration, during a Vault server outage, failover is handled immediately without human intervention. To learn more about setting up your Vault servers in HA mode, read Vault HA with Consul guide. High-availability and data-locality across datacenters requires Vault Enterprise. Enterprise Only: The Vault replication feature is a part of Vault Enterprise. HashiCorp Vault Enterprise provides two modes of replication, performance and disaster recovery. The Vault documentation provides more detailed information on the replication capabilities within Vault Enterprise. Vault performance replication allows for secrets management across many sites. Secrets, authentication methods, authorization policies and other details are replicated to be active and available in multiple locations. NOTE: Refer to the Vault Mount Filter guide about filtering out secret engines from being replicated across regions. Vault disaster recovery replication ensures that a standby Vault cluster is kept synchronized with an active Vault cluster. This mode of replication includes data such as ephemeral authentication tokens, time-based token information as well as token usage data. This provides for aggressive recovery point objective in environments where preventing loss of ephemeral operational data is of the utmost concern. If your disaster recovery strategy is to plan for a loss of an entire data center, the following diagram illustrates a possible replication scenario. In this scenario, if the Vault cluster in Region A fails and you promote the DR cluster in Region B to be the new primary, your applications will need to read and write secrets from the Vault cluster in Region B. This may or may not raise an issue for your applications, but you need to take that into a consideration during the planning. If your disaster recovery strategy is to plan for a loss of a cluster but not the entire data center, the following diagram illustrates a possible replication scenario. NOTE: Refer to the Vault Disaster Recovery Setup guide for additional information. Another common scenario to protect against, more prevalent in cloud environments that provide very high levels of intrinsic resiliency, might be the purposeful or accidental corruption of data and configuration, and or a loss of cloud account control. Vault's DR Replication is designed to replicate live data, which would propagate intentional or accidental data corruption or deletion. To protect against these possibilities, you should backup Vault's storage backend. This is supported through the Consul Snapshot feature, which can be automated for regular archival backups. A cold site or new infrastructure could be re-hydrated from a Consul snapshot. NOTE: Refer to the online documentation to learn more about Consul snapshots. There is no set limit on number of clusters within a replication set. Largest deployments today are in the 30+ cluster range. 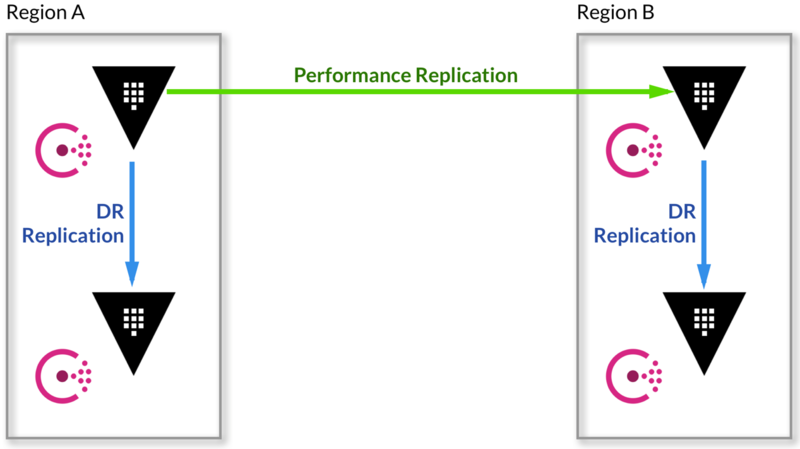 Any cluster within a Performance replication set can act as a Disaster Recovery primary cluster. 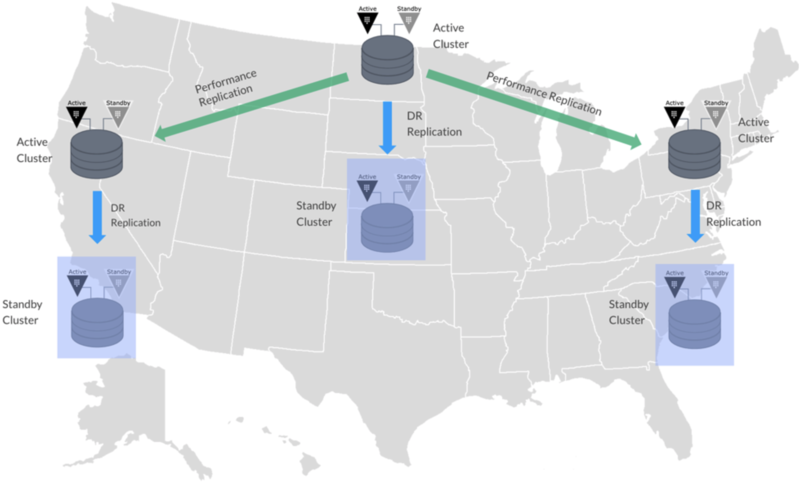 A cluster within a Performance replication set can also replicate to multiple Disaster Recovery secondary clusters. 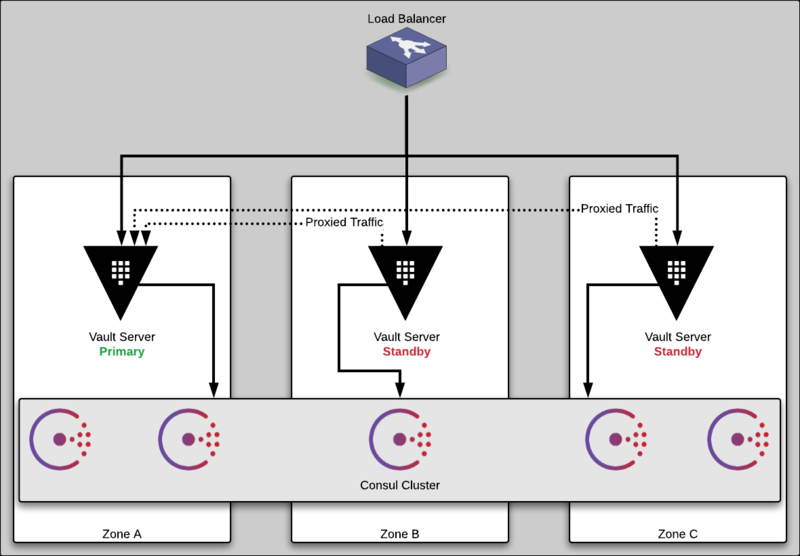 While a Vault cluster can possess a replication role (or roles), there are no special considerations required in terms of infrastructure, and clusters can assume (or be promoted) to another role. Special circumstances related to mount filters and HSM usage may limit swapping of roles, but those are based on specific organization configurations. Using replication with Vault clusters integrated with HSM devices for automated unseal operations has some details that should be understood during the planning phase. If a performance primary cluster utilizes an HSM, all other clusters within that replication set must use an HSM as well. If a performance primary cluster does NOT utilize an HSM (uses Shamir secret sharing method), the clusters within that replication set can be mixed, such that some may use an HSM, others may use Shamir. For sake of this discussion, the cloud auto-unseal feature is treated as an HSM. Consul is an integral part of running a resilient Vault cluster, regardless of location. Refer to the online Consul documentation to learn more.